George Foreman at 25 years old was a fearsome champion: 6 foot 4, biceps thick and gnarled as oak, a permanent scowl on his face and a right hand that flattened every opponent he faced. 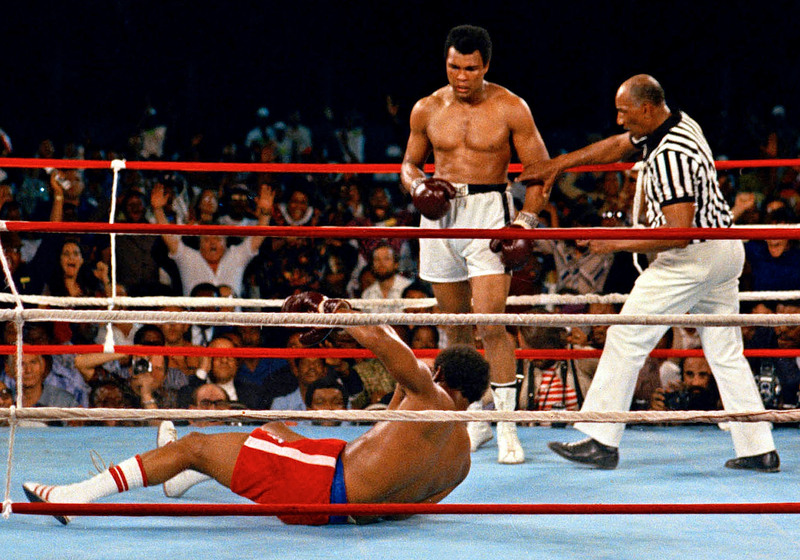 So when Muhammad Ali challenged him in 1974 for a championship fight dubbed the Rumble in the Jungle in Zaire (now the Democratic Republic of the Congo), most bets were on Foreman. Ali was seven years older and past his prime. He&apos;d had his title stripped after refusing the Vietnam draft in 1967 and was struggling to become a contender again. Foreman was undefeated and planning to stay that way. "I took the fight because I could knock him out in two rounds," he says. "I thought, &apos;$5 million for two rounds? Wow!&apos; "
The highly anticipated fight was financed by Zaire&apos;s dictator, Mobutu Sese Seko, and included a multiday music festival that featured James Brown and Miriam Makeba. Then, on Oct. 30, 1974, the two fighters entered the ring in the nation&apos;s capital of Kinshasa. "As we were in the ring," Foreman remembers, "I was staring at him trying to intimidate him and he said, &apos;George, you were a kid going to high school when I was champion of the world.&apos; "
Everyone expected Ali to dance around Foreman and avoid his powerful punches. 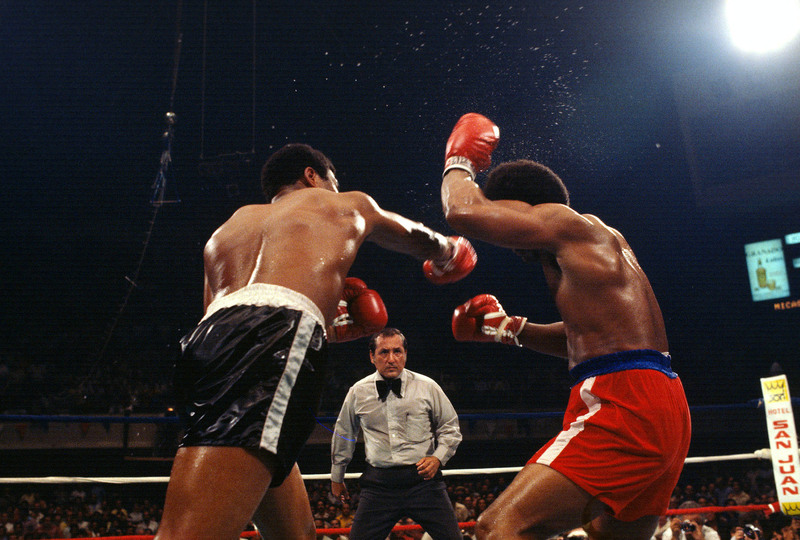 Instead, Ali came out swinging with his right hand, which seemed to disorient Foreman. "And I knew from that point, this guy could take a punch and endure." Ali kept enduring. He would lean back on the ropes and let Foreman hit him, over and over. Foreman had never gone more than two rounds in a professional fight. And he was exhausted from throwing punches by the eighth round. "He came off the ropes and I came off the ropes with my hand down to come after him," he says. "And he hit me with fastest right hand I ever remember receiving in the boxing ring. It was fast more than anything. Ka-pow! And I thought, my God I&apos;m going down. And I hit the canvas." Foreman got up at the count of nine, but the judges stopped the fight anyway. Foreman had never lost before. And it was devastating. "You never know how important it is that people would have some ... I hate to say fear but respect is kinda like fear," he says. "Now all of a sudden, these people are looking at me with a pitiful eye." At this point, Foreman didn&apos;t really have anything in his life except boxing. He&apos;d grown up poor — literally hungry, without enough food. He was so ashamed he&apos;d bring an empty lunch bag to school. "I&apos;d seen that pity before," he says. "When I was a teenager looking for a job. You fill out your application, and people look at you &apos;Ah, well, we don&apos;t need anyone right now.&apos; And there I was, back in same position — and I didn&apos;t like it." As a teenager, Foreman had channeled that rage and frustration into fighting: first on the streets, then in the ring. And after losing to Ali, he became paranoid. He didn&apos;t trust anyone and kept to himself. "You start getting a little hate in you," he says. "I&apos;m going to pay the world back, show them, that kind of thing." Foreman won his next five matches. He was on the cover of Sports Illustrated with the headline "I want Ali again." "I thought I could use that hate to get my title back," he says. "It was no longer the title — it was my title." But Ali wouldn&apos;t accept the challenge. Foreman finally got his chance for redemption when he took on a talented fighter named Jimmy Young. Everything depended on this fight. If Foreman won, Ali would be forced to accept a rematch. He&apos;d get that chance to win back his title. The fight took place in Puerto Rico on March 17, 1977. Foreman didn&apos;t score a knockout in the early rounds and the two fighters settled into a long, close fight. But by the 12th round, Foreman was clearly exhausted. At one point, he fell to his knees. He made it to the final round, but the judges declared that Young had won. Foreman headed to his dressing room. The air conditioning wasn&apos;t working in the arena and he began to pace up and down to cool off. "You are told never to sit down after a boxing match," he says. Foreman became convinced he was going to die; he says he could literally smell death in the room. He wasn&apos;t a religious man, but he started to pray to God for his life. "I started walking faster and faster, everyone is looking at me," he says. "My legs started to curl and I told everyone in the room, &apos;I&apos;m fixing to ....&apos; But before I could say another word — around me, under my feet, around me — there was nothing. I was in this deep, dark junkyard of nothing. There wasn&apos;t any hope." Foreman collapsed. His trainers pulled him up and laid him down on the table. "I said &apos;I don&apos;t care if this is death, I still believe there&apos;s a God,&apos; " he says. "When I said that, a gigantic hand reached in and held me. I jumped off the table and started screaming, &apos;Jesus Christ has come alive in me!&apos; I said, &apos;I got to save the world!&apos; They said, &apos;No, you need clothes on!&apos; They held me down until the ambulance took me to intensive care in the hospital. That experience changed me forever." Foreman gave up boxing that day. He became a minister and opened a youth center. 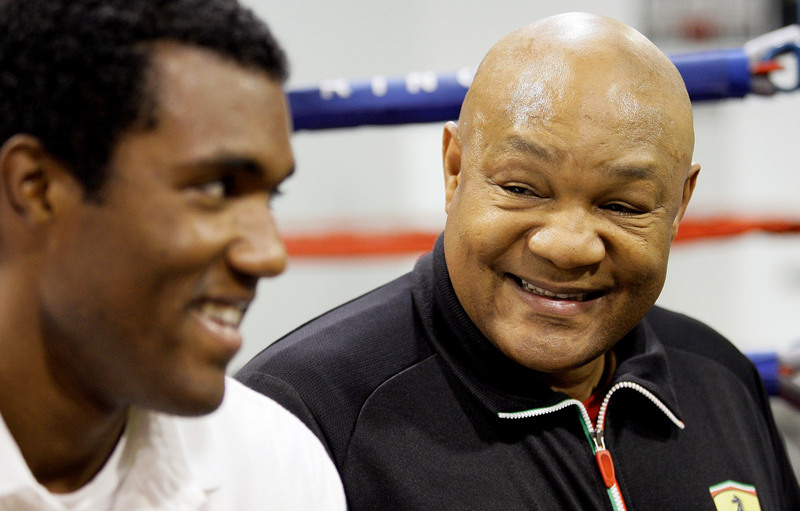 But the biggest change was right there on his face: George Foreman started smiling. Foreman looks back now and it&apos;s like his whole biography has been turned upside down. He now sees those early successes as the real failure, because he didn&apos;t appreciate them. "I went over to Africa. I didn&apos;t see a wild animal in the natural," he says. "I missed all those things. A whole lifetime missed. I was too focused on the one-two: left-hand, right-hand punch." Ten years after losing to Jimmy Young, Foreman entered the ring again. He says he did it to raise money for his youth center. But there was something else. He wanted to show he could still win, but this time without hate or anger. "The second time, I really had a time to journey in life. I learned words like, Konichiwa. I went to South Africa and met the different tribes," he says. "You get a second chance to live and it makes a better person out of you. You realize that wasn&apos;t really a loss for me in Africa — it was a gain that I didn&apos;t appreciate. In 1994, George Foreman regained his title at age 45. He was the oldest fighter to ever win the heavyweight championship.